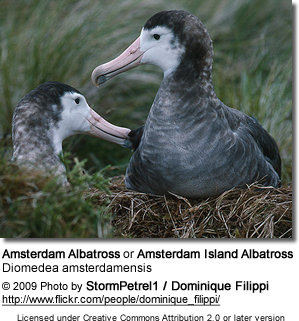 The Amsterdam Albatross or Amsterdam Island Albatross, Diomedea amsterdamensis, is a huge albatross which breeds only on Amsterdam Island in the southern Indian Ocean. It was only described in 1983, and was thought by some researchers to be a sub-species of the Wandering Albatross, exulans. BirdLife International recognizes it as a species, Clements does not, and the SACC has a proposal on the table to split the species. 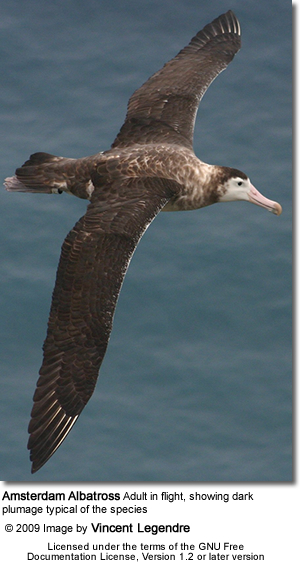 The Amsterdam Albatross breeds only on Amsterdam Island, French Southern Territories, at an elevation of between 500–600 m (1,600–2,000 ft) on Plateau des Tourbières. There is uncertainty regarding its whereabouts when it is not breeding; although, there have been possible sightings in Australia and New Zealand. 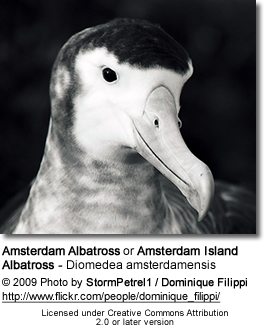 The Amsterdam Albatross is a great albatross that breeds in brown, rather than the more usual white, plumage. This bird is 4.8–8 kg (11–18 lb),and 107–122 cm (42–48 in) long with a wingspan of 280–340 cm (110–130 in). The adult bird has chocolate brown upper parts, and is white on its face mask, throat, lower breast, and belly. It has a broad brown breast band along with brown undertail coverts (vent). Its pink bill has a dark tip and dark cutting edges, and finally, its underwings are white except for the dark tip and the dark leading edge. Because of its rarity, the feeding ecology and at-sea distribution of the Amsterdam Albatross is not well understood; although, it is believed that they eat squid, crustaceans, and fish. Off-duty birds during the incubation stage of the breeding cycle cover large areas of the Indian Ocean, travelling up to 2,400 km (1,500 mi). 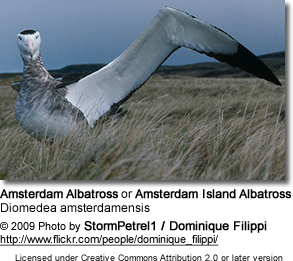 Amsterdam Albatrosses breed on a biennial basis in open marshy ground. Both parents incubate the egg in stints that last for a week, with the chick hatching after 80 days. The chick is brooded for a month, and overall takes 230 days to fledge. It is fed by its parents every three days initially, with the feedings slowing down as it approaches fledging. At the peak of weight gain the chick will weigh more than its parents, but chicks then lose weight as the extra reserves are used to grow feathers. Having fledged the young bird will remain at sea for around 5 years before returning to the colony, and begin breeding a few years after returning. The breeding "language" of the Amsterdam Albatrosses is similar to that of the Wandering Albatross. 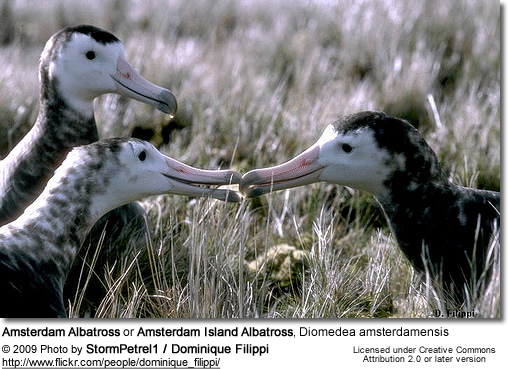 The Amsterdam Albatross is listed as critically endangered, by the IUCN, with an occurrence range of 4,400,000 km2 (1,700,000 sq mi) and a breeding range of only 7 km2 (2.7 sq mi). The population upon discovery was just 5 breeding pairs, with conservation this has increased to 18 to 25 breeding pairs. The world current population is estimated at 80 mature individuals and a total of some 130 birds. 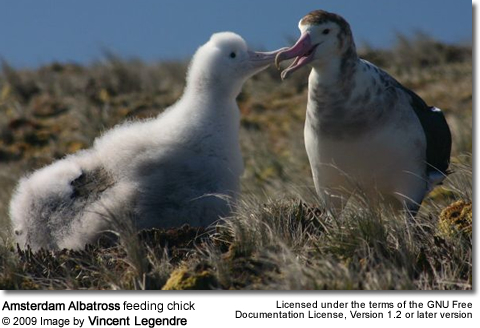 The island on which this albatross breeds has undergone a significant decline in habitat condition due to the introduction of feral cats, cattle, and longline fishing. Also, due to the fact that they is one breeding location, they are especially susceptible to disease such as Pasturella multocida (Avian Cholera) and Erysipelothrix rhusiopathidae. To help in the conservation efforts banding of the birds and frequent censuses are undertaken, and fencing to keep the cattle out of their breeding areas. Albatrosses belong to Diomedeidae family and come from the Procellariiformes order, along with Shearwaters, Fulmars, Storm-petrels, and Diving-petrels. They share certain identifying features. First, they have nasal passages that attach to the upper bill called naricorns. Although the nostrils on the Albatross are on the sides of the bill. The bills of Procellariiformes are also unique in that they are split into between 7 and 9 horny plates. Finally, they produce a stomach oil made up of wax esters and triglycerides that is stored in the proventriculus (stomach). This is used against predators as well as an energy rich food source for chicks and for the adults during their long flights. Diomedea amsterdamensis can be broken down into Diomedea from the Greek hero Diomedes whose companions were turned to birds, and amsterdamensis, a Latin form of Amsterdam the island where they are found.